Westmount's Greene Ave, along with Wood and Clarke, have a traffic light system that is unusual for the de Maisonneuve bike path. This system is a poor choice for a high volume bicycle path such as de Maisonneuve, the principle east west bicycle corridor of a major city. 1. Unlike most of the path, the walk and green signals are on separate time sequences, and there is no indication which of the two signals a cyclist is supposed to use. For this reason, Westmount issues many bicycle traffic tickets in an attempt to enforce a system that is different from the path's expected norm. Many cyclists, in response to these crackdowns, walk their bicycles through the walk phase of these three intersections. 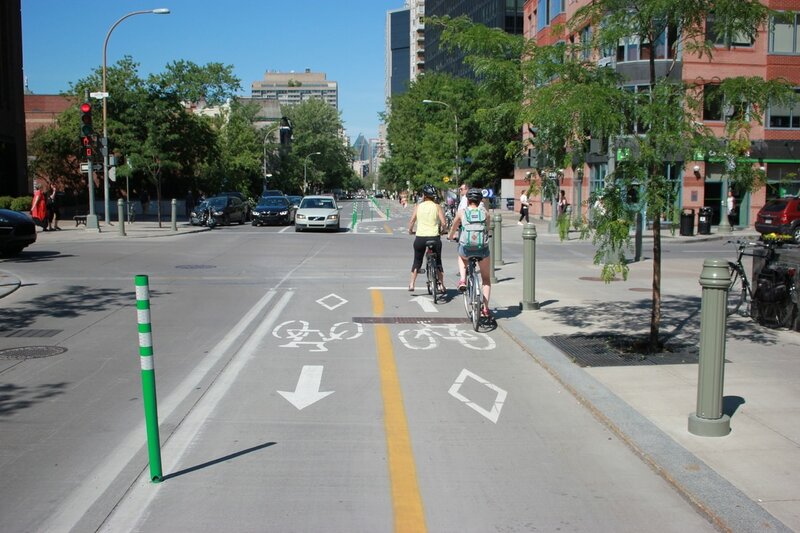 This is an inappropriate design for a bicycle path, especially a high volume one such as de Maisonneuve. 2. In Ville Marie, which has the bulk of traffic intersections, cyclists have an advance starting period during which left turning cars are prohibited from crossing the path. This leading straight ahead green arrow is not present on any Westmount bicycle path intersections. Westmount should not continue to ignore this safety hazard to cyclists caused by left turning cars. 3. Unlike Ville Marie, there are no signs indicating that bicycles have priority over left turning cars within the intersection. This adds to the confusion by drivers over who has priority, cyclists or left turning cars, during the solid green signal. 4. Greene Ave, as it narrows within the intersection, forces cyclists and left turning cars together. This intersection in particular should have clearly painted pathways within the intersection to warn drivers that they are entering a bicycle path.